Postoperative atrial fibrillation (AF) occurs in 15% to 30% of patients who undergo isolated CABG. Patients who develop AF after these procedures are at risk for longer hospital stay, perioperative morbidity and mortality, and long-term mortality. Identifying specific patients who are at high risk for developing AF after CABG may help define a population that is more likely to benefit from antiarrhythmic drugs or other AF prevention strategies. Previous analyses of patients undergoing CABG have suggested that certain preoperative, intraoperative, and postoperative factors can be used to determine the risk of postoperative AF (POAF), but these models can be cumbersome to apply and may not always be useful. In the American Journal of Cardiology, my colleagues and I had a study published that tested a simplified clinical tool using preoperative patient characteristics to identify those at high risk for POAF following CABG. Using the Society of Thoracic Surgery database, we identified a subset of preoperative variables that predispose patients to POAF. Using these variables, we created a risk index that had a moderate prediction power to identify patients at high risk of developing POAF. 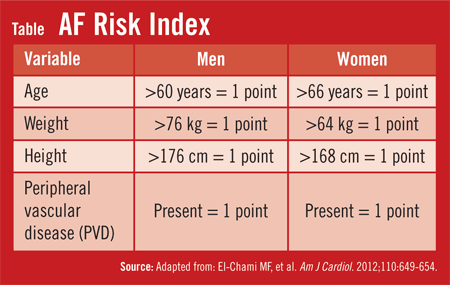 Patients were assigned point values according to the AF Risk Index Table. Patients scoring 4 points on the AF risk index had a 30% to 40% chance of developing POAF. Conversely, those with a score of 0 points had a less than 10% risk. 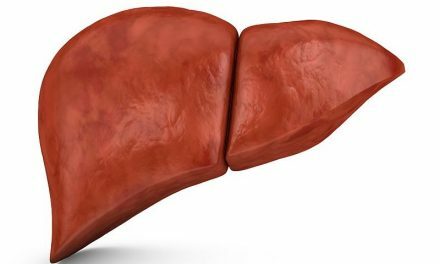 Advanced age was the only factor that consistently predicted the occurrence of POAF in CABG patients. The effects of increased weight and height and the presence of peripheral vascular disease (PVD) on AF risk have been previously reported, and our study supports that these factors contribute to higher risk of developing POAF. PVD, in particular, may signal the severity of illness and the presence of multiple comorbidities that predispose CABG patients to POAF. The prediction model in our study is simple to implement and can be used universally because the information needed to calculate risk scores is readily available. If patients undergoing CABG score 3 or 4 points using our model, it may behoove physicians to provide patients with anti-arrhythmic drugs or other interventions to prevent AF. That said, it should be noted that our model is only applicable to patients undergoing CABG. Studies need to establish if this AF risk index is applicable to patients receiving valve surgery. Prospective analyses using the risk index may further validate it as a useful tool in clinical practice. If validated, we may ultimately be able to better identify and manage high-risk patients with preventive interventions. El-Chami MF, Kilgo PD, Elfstrom KM, et al. Prediction of new onset atrial fibrillation after cardiac revascularization surgery. Am J Cardiol. 2012;110:649-654. Available at: http://www.ajconline.org/article/S0002-9149(12)01245-3/abstract. El-Chami MF, Kilgo P, Thourani V, et al. New-onset atrial fibrillation predicts long-term mortality after coronary artery bypass graft. J Am Coll Cardiol. 2010;55:1370-1376. Available at: http://www.sciencedirect.com/science/article/pii/S0735109710002755. Saxena A, Dinh DT, Smith JA, et al. Usefulness of postoperative atrial fibrillation as an independent predictor for worse early and late outcomes after isolated coronary artery bypass grafting (multicenter Australian study of 19,497 patients). Am J Cardiol. 2012;109:219-225. Mrdovic I, Savic L, Krljanac G, et al. Incidence, predictors, and 30-day outcomes of new-onset atrial fibrillation after primary percutaneous coronary intervention: insight into the RISK-PCI trial. Coron Artery Dis. 2012;23:1-8. Lau DH, Huynh LT, Chew DP, et al. Prognostic impact of types of atrial fibrillation in acute coronary syndromes. Am J Cardiol. 2009;104:1317-1323. Zangrillo A, Landoni G, Sparicio D, et al. Predictors of atrial fibrillation after off-pump coronary artery bypass graft surgery. J Cardiothorac Vasc Anesth. 2004;18:704-708. Mikhael F. El-Chami, MD, has indicated to Physician’s Weekly that he has received research grant support from Medtronic, Inc.